For the next selection on the Highlife Turntable, I have selected the track Onyema Ife Onye Bunobi by Obiajulum Super Sound Power of Africa off an early 80's Nokwa Studio release. The word Obiajulu means Contented Heart. Pat Enebeli was the lead singer. 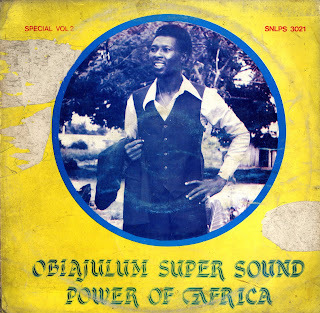 He was a Ukwauni performer and recorded many records for major labels like Odec and OjiKutu and a few others on more obscure labels like Nokwa Sound and Ma-Rex records. The song has all the components of a great Ukwauni song: introspective vocals, a thready horn and a spacey guitar line. This song is a little slower in tempo than the music of earlier Ukwauni pioneers like Rogana Ottah or King Ubulu, but is even more vibrant and expressive. The horn playing is reminiscent of Charles Iwegbue whose trumpet playing in the early 70's was instrumental in creating the modern Ukwauni sound. From the opening guitar lines the songs floats along as the vocals and horn playing weaves in and out the tune. There are several great stretches. Check out the horn playing that starts at the 7.35 mark and the way the vocals and horn play off each other after that. Just beautiful. There is also some nice guitar work around the 10.45 mark and another sweet horn solo starting at the 12 minute mark. The vocals at the end are also haunting in their simplicity and grace. Check out the way the horns fade out the song. The song really showcases the spirituality Ukwauni artists were striving for. In a dedication on another release Obiajulu said " This is special advice from the Obiajulu to the people who feel that they are on top, that they should allow the junior ones to grow. Why? Because a tree cannot make a forest." I hope you like the music.